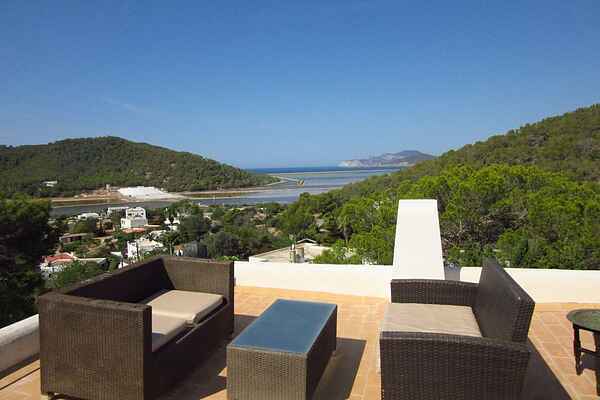 Beautiful villa located a few minutes drive to the beautiful beaches: Salinas and Es Cavallet. With their many restaurants such as Jocky club, Chrinquito and Chiringay and experiential beach. always open L'escollera restaurant.Vanuit terraces in the evening you can enjoy the views over the salt flats. Supermarket 400 meter.Een large kitchen fully equipped. The villa has two bedrooms with original bathrooms. From the garden one goes to both guest rooms. Both with separate ingang.Mooie spacious studio with a large modern shower cubicle. The second guest house with its own beautiful bathroom has an entrance from the garden and from the parking lot. This villa is wonderful place to relax and chill outs many .Not suitable for small children 2 to 5 years.